The commander of Singapore-led Combined Task Force 151 has met with senior officers from both the Royal Navy of Oman and the Royal Oman Police Coast Guard during a recent engagement visit to Muscat. 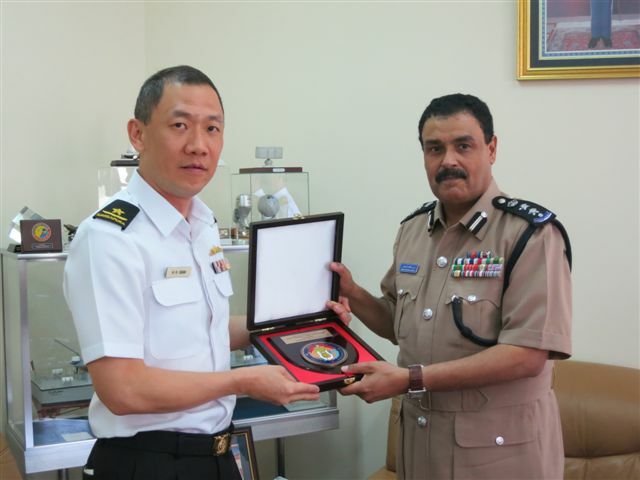 Rear Admiral Giam Hock Koon of the Republic of Singapore Navy met with Commodore Mahfoodh bin Hamood bin Mohammed al Wahaibi, the Director General for Operations and Plans of the Royal Navy of Oman, and the Director General of the Royal Oman Police Coast Guard, Col. Bader bin Khalfan al Zadgali. During the meetings, the leaders exchanged views on the current regional maritime security and piracy situation. While noting that measures taken by counter piracy forces and the maritime industry have been very effective in keeping piracy figures down this year, they also agreed on the need to remain vigilant and for continued information sharing and coordination of efforts by international counter-piracy forces and regional navies. “Oman is an important contributor in the counter-piracy fight and we greatly appreciate their support of Combined Maritime Forces in our counter-piracy efforts,” said Rear Admiral Giam. Oman’s support of CTF-151’s counter-piracy efforts includes providing coalition ships access to Omani ports such as Salalah and Muscat for replenishment, and maintaining communication channels with coalition forces. Counter-piracy forces cooperate extensively with regional nations and international maritime organizations for logistics support and by sharing information and coordinating their efforts at sea and in the air. CTF-151 counter-piracy efforts help secure freedom of navigation and protect legitimate maritime activities on the high seas.